As usual the forthcoming Wealden Railway Group's annual show has a competition open to members. This time the challenge is to build a full-sized cardboard mock-up for a layout - the catch being that it must fit inside an airline "carry-on" case. Luckily we do not have to supply the bag, but the layout must fit a notional shape of 85cmx30cmx22.5mm or roughly 30x12x9 inches. 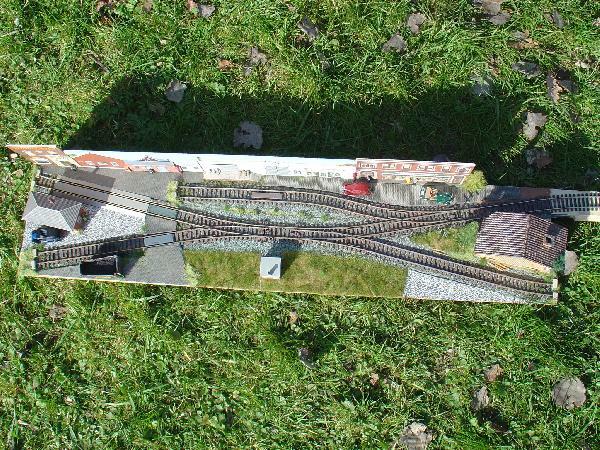 In theory a shunty-plank 5ft by 1ft can be produced, as long as one is careful about placing the buildings, trees and other tall items of scenery. My unused model collection includes the US-style rolling stock from Lazy River, plus a Terrier and a Pannier tank with a collection of pre-grouping goods wagons, so there is scope for some layout variety. 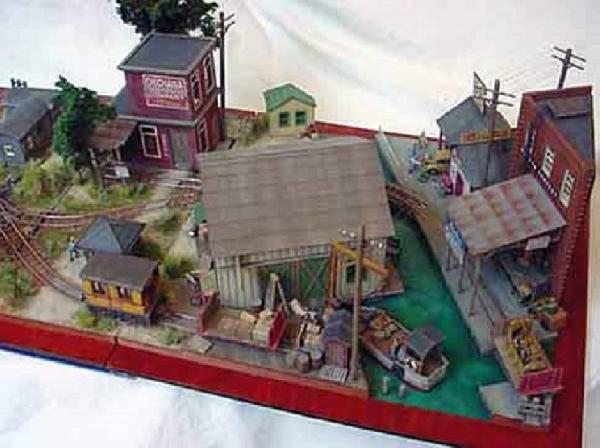 After some thought I've come up with an American switching yard with a car float to act as an in-view fiddle yard. If this were built, it could have a fiddle-yard added after the competition to provide a little more scope for moving trains on and off the scenic area. The model period will be 1950-60. The other idea is a return to my Shellsea Tramway theme, which is a combination of Wantage and the Selsey Tramway. Set in Sussex, the town of Shellsea replaces the actual Emsworth and the tramway leads off towards Thorney Island, though in the fictional setting this is Fayling Island and is separated from the mainland by a broad channel, crossed by a ferry. 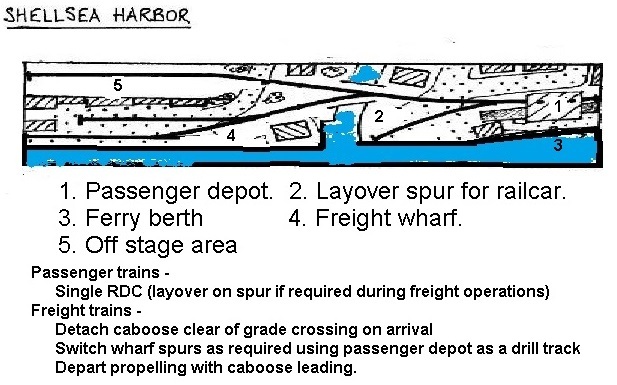 The tramway's terminus is beside the ferry's wharf and there are kick-back sidings serving a commercial dock. Thus the Terrier will be right at home and there are one or two Hornby 0-4-0 saddle tanks ripe for re-gearing, following descriptions of the work in Railway Modeller and on the Gnatterbox website. The model will be set in the 1930s, which is a period I've not explored before. It would also mark a return to the British standard gauge modelling scene last visited with my Wittering layout built in the 1980s. The card mock-ups are almost complete and layout plans will be posted here soon. I love the Shellsea plan. I am determined to build it one day, honest! It's not quite that one, Martin - not enough length. This one has the feel of the ferry quay end of the original scheme, and adds a couple of sidings and a kick-back at the other end, with the line to the Southern station sneaking off behind the sheds and Harbourmaster's Office/Customs House. I'll draw up a plan next week and post it here. Please do... I love the 'feel' of the original but felt that it would be a challenge to get the change of scenes to come across convincingly in the space.. I say 'but' as if that's a bad thing! One solution was to keep the dimensions but model it in 3mm scale. Another was to bend it it into an 'L' shape and physically separate the two ends that way. Out of curiosity, Had you planned this with 'setrack' type points for OO? Yes, an L shaped version of the original would work very well, Martin. As for TT that would involve a bit of scratch building, though motor bogies inside Wantage-style trams shouldn't tax even my resources. The new OO version has 3 wyes and a small radius turnout in view; the fiddle yard point is a Setrack L/H. Here's the Shellsea idea. The baseboard folds and the hinge-blocks are hidden by de-mountable buildings, the House and Fish Shed. 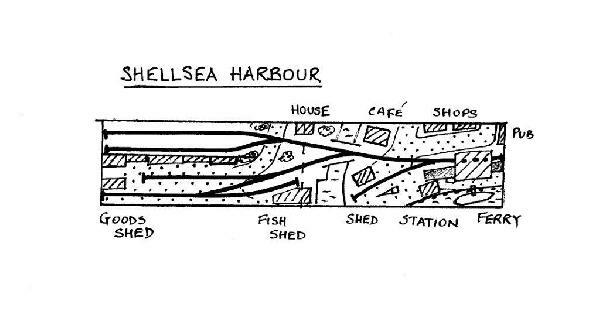 The front of the baseboard between the Fish Shed and the left hand end of the layout is treated as a dockside wall - the commercial part of the harbour. The platform below the roof will take a Terrier or small saddle tank loco and two four-wheeled coaches. Goods trains will be 3 or 4 wagons, running without a brake van (prototypes for this at Weymouth Harbour and the Wantage Tramway). This plan is growing on me and as I haven't built anything for a while it's about time I did. I've trimmed it down a bit, removing two turnouts (points cost money), and transplanted it to Conrail territory with an RDC providing an (unbelievable?) Amtrak or CN passenger service... Mainly because that's the area and era my US HO stock represents. I've also trimmed a "u" from the title. That works rather well, Bob. Like it. The loss of the kick-back spur makes perfect sense in US mode as even a short switcher and 40ft boxcar would use up all the dockside lead track. I started off with one fiddle track, but decided to add another to make turn-round between trains faster for exhibition use - although the rear track will be a bit restricted as the line is inside the warehouses; if I run a railcar it wouldn't matter. I also have the turnouts in stock as I've been buying them second hand for some time "just in case". All I've got to do now is round out my collection of wagons with something LMS/NE. Your two four-wheeled coaches have found a new home, and I have a couple of goods brake-van bodies to chop up into a luggage wagon on a short chassis. Still finishing off the card model but will post pictures next week-end after the WRG show. For the far future, I'm thinking, perhaps, of something along the lines of Crystal Creek, but made 54x10 or 12 ins. This could multimode between my American HO stock or be GWR - with different building for each version. and also embracing Kristallberg (MTI#88 ) which was a slightly larger version of the Stockton Tramway which appeared in MTI#87. ........and flipped it end-for-end and top-to-bottom, but always thought of joining up the top (bakery) siding and station track to make a run-round, plus a new bakery siding - all on a longer, wider board. which a bit of thought showed was too much to get into the baseboard size stipulated by the competition rules. which as you'll see is pretty much what the latest version of Shellsea is based on. Stockton would also work with a sector plate at the left end? Whilst it doesn't have to be used, it would provide the possibility of a run round if needed? With a harbour theme, a sector plate would fit in well...and could even be 'automated'? 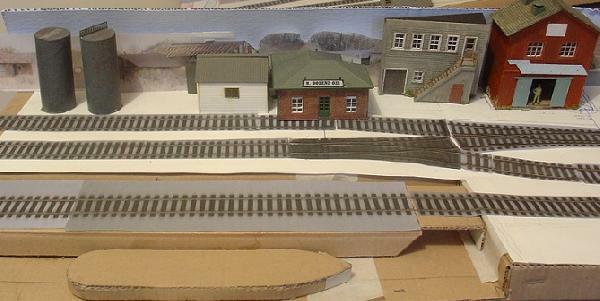 Now the cardboard layout has been seen in public I can add the pictures here. Please excuse the state of the model, which was made of 100% recycled card - however it has been a very useful planning tool and has helped highlight areas where some further thought is needed and extra care will need to be taken during construction. The finished result has been invited to the WRG's 2016 show. Next is the central bit with buildings hiding the hinge posts. They will get a bit of a re-design in their final form. I have long given thought to how to 'eliminate' the raised hinge syndrome on a folding baseboard. Whilst I appreciate boards can be separated and secured for transit by a variety of means, if we wish to have folding boards, we seem stuck with the 'raised hinge' problem...and how to disguise them, without having to have a view block right in front all the time? Has anyone tried slotted bars, which lie horizontal when the boards are laid flat? Years ago I added hinges to the front hinge on an HO layout of mine, "Holden, Stroud County" (which was in MTI's #9 & 10) so that it folded forwards out of the line of sight. I meant for it to fold right over but didn't quite make it good enough to do that. Jack Shortliner developed the idea on paper to use split hinges to make the main part removable - it would've been an interesting bit of engineering if actually made. What is this thing called "Spare Time"...? ?